Keratin is a fibrous protein found in nails, hair and the outer layer of skin. It is normally hard, but can become soft under the nail in the presence of moisture. Nail disorders are often due to keratin debris spreading within the nail bed. Keratin debris can build up under toenails and fingernails, causing separation between the nail and nail bed. If left untreated, nails can split and fall off. Because keratin debris is trapped between the nail and its bed, the detachment (onycholysis), causes discoloration, either dark or yellow in color, so the nail no longer looks clear. A pocket of debris forms and can get longer if left untreated. 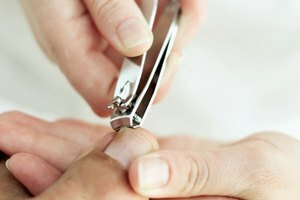 During a manicure, softened keratin debris looks like cottage cheese on the manicure tool, according to Xenna, a nail, skin and hair products retailer. Nail fungal treatments help to soften the keratin debris and exfoliate it away. Keratin debris is also associated with ear infection (otitis), according to Merck. Certain solvents may be used to dissolve the debris buildup from the ear canal or site of infection. Treatment for keratin debris buildup in the nail consists of oral antifungal treatment drugs such as terbinafine or itraconazole or topical gels, lacquers and liquid solutions that can be applied topically to the site of infection.